We believe that this may be the best warranty in the air conditioning business. The compressor in your new ASXC18 air conditioning system is covered by a Lifetime Unit Replacement Limited Warranty*. If the compressor ever fails, a new condensing unit will be provided to the original purchaser of the central air conditioning system as long as they live in the same single-family residence. All remaining parts are covered by a 10-Year Parts Limited Warranty*. For a full description of all warranties applicable to this product, please call us. We believe that this may be the best warranty in the air conditioning business. The compressor in your new ASXC16 air conditioning system is covered by a Lifetime Unit Replacement Limited Warranty*. If the compressor ever fails, a new condensing unit will be provided to the original purchaser of the central air conditioning system as long as they live in the same single-family residence. All remaining parts are covered by a 10-Year Parts Limited Warranty*. For a full description of all warranties applicable to this product, please call us. We believe that this may be the best warranty in the air conditioning business. The compressor in your new ASX14 air conditioning system is covered by a Lifetime Unit Replacement Limited Warranty*. If the compressor ever fails, a new condensing unit will be provided to the original purchaser of the central air conditioning system as long as they live in the same single-family residence. All remaining parts are covered by a 10-Year Parts Limited Warranty*. For a full description of all warranties applicable to this product, please call us. 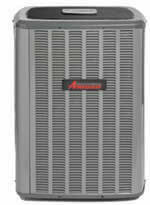 The Amana® brand ASX13 Air conditioner uses the chlorine free refrigerant R-410A. The compressor and functional parts in your new 13 SEER air conditioning system are covered by a 10-Year Parts Limited Warranty*. For a full description of all warranties applicable to this product, please call us. The compressor in your new 16 SEER air conditioning system is covered by a Lifetime Limited Warranty*. If the compressor ever fails, a new one will be provided to the original purchaser of the central air conditioning system as long as they live in the same single-family residence. All functional parts are covered by a 10-Year Parts Limited Warranty. For a full description of all warranties applicable to this product, please call us. The compressor in your new SSX14 air conditioning system is covered by a Lifetime Limited Warranty. * If the compressor ever fails, a new one will be provided to the original purchaser of the central air conditioning system as long as they live in the same single-family residence. All functional parts are covered by a 10-Year Parts Limited Warranty. For a full description of all warranties applicable to this product, please call us. 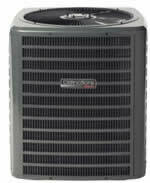 This air conditioning system will provide your home with dependable, cool comfort for many years. It’s designed for a value-conscious homeowner who appreciates the energy savings possible with a new central air conditioner. This air conditioner is covered by a 10-Year Limited Parts Warranty*. For a full description of all warranties applicable to this product, please call us.